Did you make your mom a cake this past Mother’s Day? 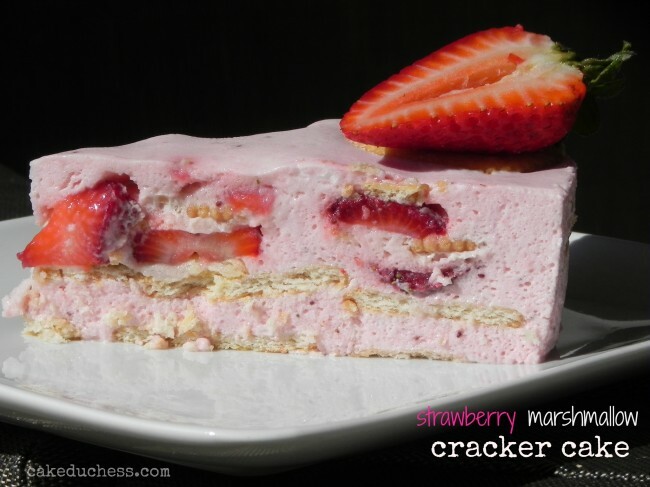 If you didn’t and you want to make it up to her, make her this fun strawberry marshmallow and cracker cake! Did I mention it’s fun? It’s fun! It’s fun because it involves marshmallow fluff. When is the last time I bought marshmallow fluff? I honestly don’t think I ever did. What was I missing? A lot! Because this stuff is so much fun to use in a quick dessert. And when you’re making a dessert from the very creative Cristina Tosi from Momofuku, you can expect it to have a little marshmallow fluff. So did you make your mom a cake this past weekend? It’s ok if you didn’t. If I had planned a little better, I would’ve shared this cake in time for you to make for her. But it’s never too late. Surprise her with it any day of the week. 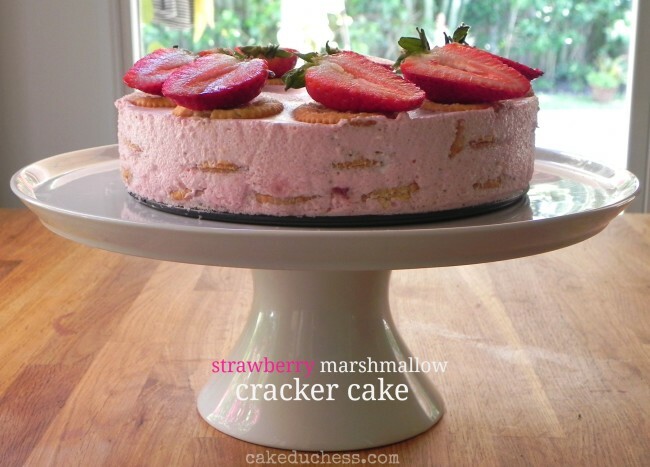 Or make this strawberry marshmallow and cracker cake for yourself! The only bad thing is you have to let it set overnight in the fridge. Patience…it’s so worth the wait! The other bad thing is that if you like a sweet and salty combo as much as I do, you will find yourself going back for more little tastes. All for recipe testing purposes, that’s what I told myself. My son called it the mousse cake. 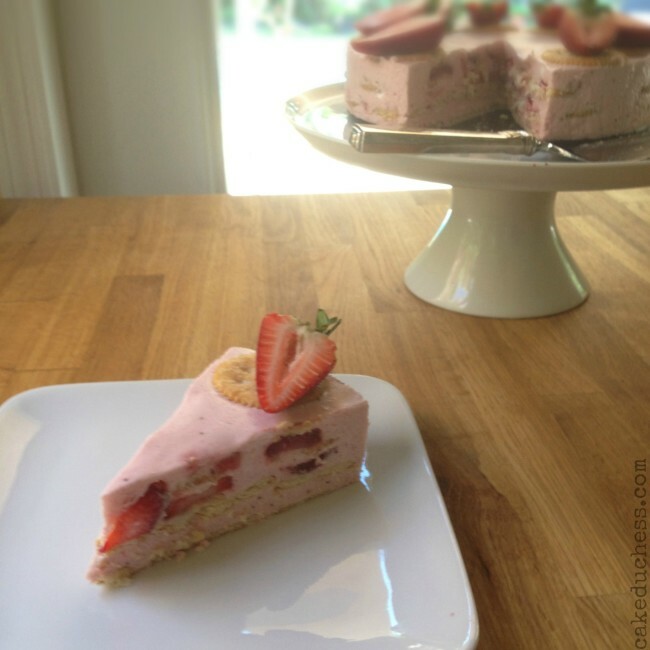 He keeps asking me when am I going to make the strawberry mousse cake again. Soon. This can be your go-to cake to make all strawberry season. It’s so pretty and delicate. 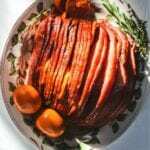 Your lucky friends or family you will make this for will not expect the cracker surprise and will thing you slaved hours over it. But remember: Let it set over night! That’s the most important thing to remember after adding marshmallow fluff to your grocery list. 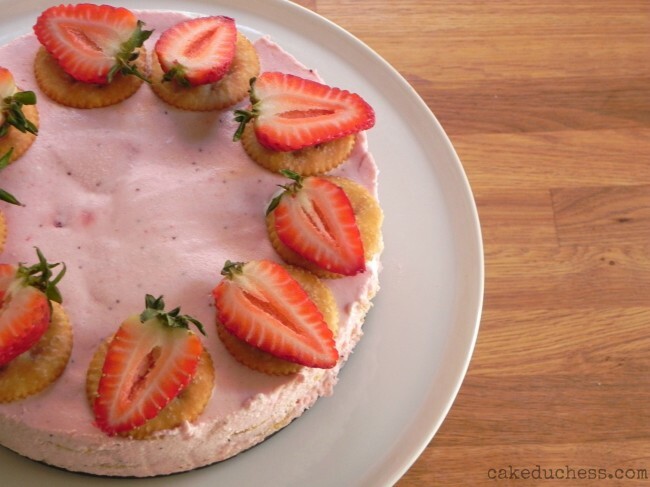 A no-bake strawberry cake made with crackers, marshmallow cream and fresh strawberries. Set aside 8 perfect strawberries and 8 crackers for a garnish. Hull and slice the remaining strawberries. Transfer 1 1/2 cups of the berries to a food processor; add the sugar and process until pureed. Add the gelatin and process briefly to bend. With a spatula press and stir the berry puree through a fine-mesh sieve (this will remove any seeds). Lightly grease an 8-inch springform pan. Place a layer of crackers on the bottom of the pan to cover, breaking a few of them in half as needed to fit into an even layer. Spoon one-third of the marshmallow mixture on top; top with another layer of crackers, then spoon half of the sliced berries on top. Add another third of the marshmallow mixture, another layer of crackers and the remaining sliced berries. Top with the remaining marshmallow mixture. Arrange the reserved 8 crackers to form a ring along the outside edge. Refrigerate the cake overnight. Halve the 8 reserved strawberries and place on top of the crackers. Cut the cake with a warmed thin, sharp knife. I grew up on fluffernutter sandwiches, and still indulge every so often. I think I could eat this whole cake in two sittings..seriously. I'm with your son..more 'mousse' cake, please. Now I'm going to be craving this all day..thanks ;D xoxo BTW..it never ceases to amaze what you can do with crackers of all sorts. 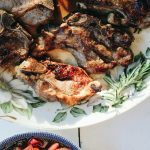 This looks almost too good to be true, so beautiful and delicious looking and so super simple, love it! Oh gosh… I love Fluff. I think it'd be hard to pry it from my hands long enough to include it on this cake, which looks glorious, by the way. Hope you had a wonderful Mother's Day! Whoa, this combo is blowing my mind! YUM. Gotta make this, gotta make this, right now! What a beautiful cake! any mother would be VERY happy with this! Looks beautiful!!! It looks so fluffy!! What a pretty spring cake, I love the mousse! What an amazing cake, sounds so good! And every time I come here I get so excited, I just love your redesign – I know it isn't new, but I just love it! What a pretty, pretty cake! I bet it was amazing and tasty! What a unique recipe Lora. I like the sweet and salty, only problem it makes me eat more of it!! Your blog changes look great. Have a great weekend. I've never heard of a cake using these ingredients before, Lora. Leave it to Cristina Tosi to dream this up! What a fun, pretty cake. I'm super intrigued by the use of crackers in there. And I've NEVER had marshmallow fluff. I don't think I've truly lived yet. Such a pretty cake, Lora, and I love how easily it comes together. Wow that is incredible!! I need to make this! Really interesting cake! I'm kind of perplexed. But in a good way! 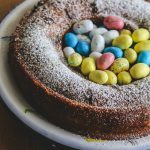 This cake would be a favorite in my house…it looks so light and delicious! 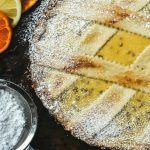 This is such a different dessert and in such an enticing way. Looks amazing. This would be the perfect cake for a girl´s party! The idea of salty crackers in a very sweet dessert is so clever. Love the sweet and salty, love it! What a unique and beautiful cake! I need to try it! 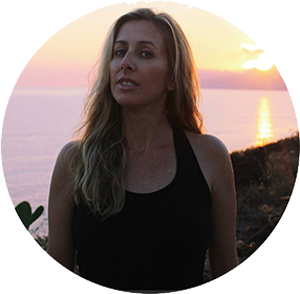 Love the new blog look…pretty and fresh! This cake looks amazing!!! and marshmallow fluff?!! yum! totally going to try this one!